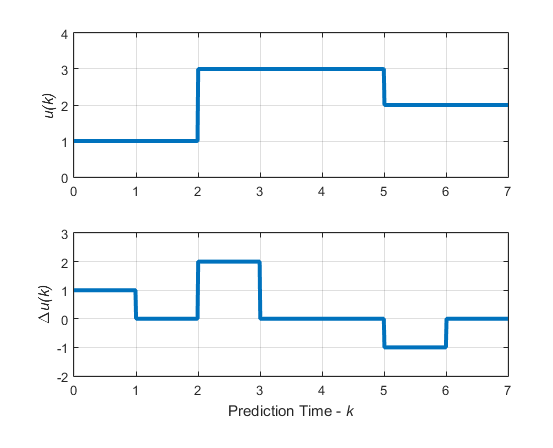 Model predictive control solves an optimization problem – specifically, a quadratic program (QP) – at each control interval. The solution determines the manipulated variables (MVs) to be used in the plant until the next control interval. The objective, or "cost", function — A scalar, nonnegative measure of controller performance to be minimized. Constraints — Conditions the solution must satisfy, such as physical bounds on MVs and plant output variables. Decision — The MV adjustments that minimize the cost function while satisfying the constraints. The following sections describe these features in more detail. Here, zk is the QP decision. As described below, each term includes weights that help you balance competing objectives. While the MPC controller provides default weights, you will usually need to adjust them to tune the controller for your application. k — Current control interval. p — Prediction horizon (number of intervals). ny — Number of plant output variables. yj(k+i|k) — Predicted value of jth plant output at ith prediction horizon step, in engineering units. rj(k+i|k) — Reference value for jth plant output at ith prediction horizon step, in engineering units. sjy — Scale factor for jth plant output, in engineering units. wi,jy — Tuning weight for jth plant output at ith prediction horizon step (dimensionless). The values ny, p, sjy, and wi,jy are constant controller specifications. 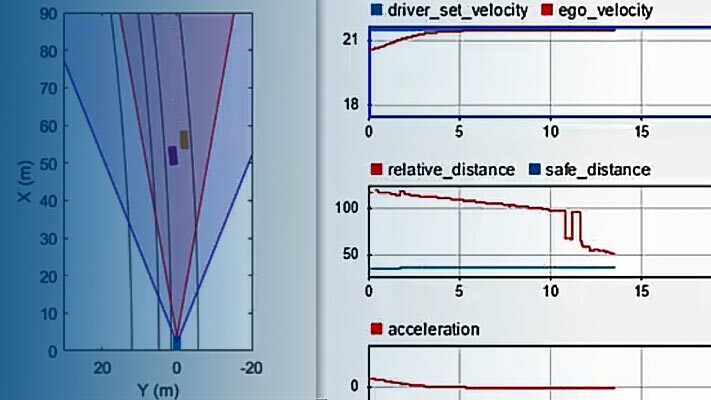 The controller receives reference values, rj(k+i|k), for the entire prediction horizon. The controller uses the state observer to predict the plant outputs, yj(k+i|k), which depend on manipulated variable adjustments (zk), measured disturbances (MD), and state estimates. At interval k, the controller state estimates and MD values are available. Therefore, Jy is a function of zk only. nu — Number of manipulated variables. uj,target(k+i|k) — Target value for jth MV at ith prediction horizon step, in engineering units. sju — Scale factor for jth MV, in engineering units. wi,ju — Tuning weight for jth MV at ith prediction horizon step (dimensionless). The values nu, p, sju, and wi,ju are constant controller specifications. The controller receives uj,target(k+i|k) values for the entire horizon. The controller uses the state observer to predict the plant outputs. Thus, Ju is a function of zk only. wi,jΔu — Tuning weight for jth MV movement at ith prediction horizon step (dimensionless). The values nu, p, sju, and wi,jΔu are constant controller specifications. u(k–1|k) = u(k–1), which are the known MVs from the previous control interval. JΔu is a function of zk only. In addition, a control horizon m < p (or MV blocking) constrains certain MV moves to be zero. εk — Slack variable at control interval k (dimensionless). ρε — Constraint violation penalty weight (dimensionless). Sy — Diagonal matrix of plant output variable scale factors, in engineering units. Su — Diagonal matrix of MV scale factors in engineering units. r(k+1|k) — ny plant output reference values at the ith prediction horizon step, in engineering units. y(k+1|k) — ny plant outputs at the ith prediction horizon step, in engineering units. utarget(k+i|k) — nu MV target values corresponding to u(k+i|k), in engineering units. Output predictions use the state observer, as in the standard cost function. The alternative cost function allows off-diagonal weighting, but requires the weights to be identical at each prediction horizon step. The standard cost functions employs weights wi,jy, wi,ju, and wi,jΔu that are constant with respect to the index, i = 1:p.
The matrices Q, Ru, and RΔu are diagonal with the squares of those weights as the diagonal elements. Certain constraints are implicit. For example, a control horizon m < p (or MV blocking) forces some MV increments to be zero, and the state observer used for plant output prediction is a set of implicit equality constraints. Explicit constraints that you can configure are described below. The most common MPC constraints are bounds, as follows. yj,min(i)sjy−εkVj,miny(i)≤yj(k+i|k)sjy≤yj,max(i)sjy+εkVj,maxy(i), i=1:p, j=1:nyuj,min(i)sju−εkVj,minu(i)≤uj(k+i−1|k)sju≤uj,max(i)sju+εkVj,maxu(i), i=1:p, j=1:nuΔuj,min(i)sju−εkVj,minΔu(i)≤Δuj(k+i−1|k)sju≤Δuj,max(i)sju+εkVj,maxΔu(i), i=1:p, j=1:nu. εk — Scalar QP slack variable (dimensionless) used for constraint softening. yj,min(i), yj,max(i) — lower and upper bounds for jth plant output at ith prediction horizon step, in engineering units. uj,min(i), uj,max(i) — lower and upper bounds for jth MV at ith prediction horizon step, in engineering units. Δuj,min(i), Δuj,max(i) — lower and upper bounds for jth MV increment at ith prediction horizon step, in engineering units. Except for the slack variable non-negativity condition, all of the above constraints are optional and are inactive by default (i.e., initialized with infinite limiting values). To include a bound constraint, you must specify a finite limit when you design the controller. This section describes the matrices associated with the model predictive control optimization problem described in Optimization Problem. where JM depends on the choice of blocking moves. Together with the slack variable ɛ, vectors z0, ..., zm–1 constitute the free optimization variables of the optimization problem. In the case of systems with a single manipulated variables, z0, ..., zm–1 are scalars. Consider the blocking moves depicted in the following graph. This graph corresponds to the choice moves=[2 3 2], or equivalently, u(0)=u(1), u(2)=u(3)=u(4), u(5)=u(6), Δ u(0)=z0, Δ u(2)=z1, Δ u(5)=z2, Δ u(1)=Δ u(3)=Δ u(4)=Δ u(6)=0. For more information on manipulated variable blocking, see Manipulated Variable Blocking. Here, I1 = … = Ip are identity matrices of size nu. You may want the QP problem to remain strictly convex. If the condition number of the Hessian matrix KΔU is larger than 1012, add the quantity 10*sqrt(eps) on each diagonal term. You can use this solution only when all input rates are unpenalized (WΔu=0) (see Weights). In this case, the block-diagonal matrices repeat p times, for example, once for each step in the prediction horizon. You also have the option to use a combination of the standard and alternative forms. For more information, see Weights. Next, consider the limits on inputs, input increments, and outputs along with the constraint ɛ≥ 0. To reduce computational effort, the controller automatically eliminates extraneous constraints, such as infinite bounds. Thus, the constraint set used in real time may be much smaller than that suggested in this section. In this case, matrices Mz, Mɛ, Mlim, Mv, Mu, and Mx are obtained from the upper and lower bounds and ECR values. and the model predictive controller sets Δu(k)=z*0, u(k)=u(k–1)+Δu(k).